SAN JOSE, Calif. (CN) – The ongoing dispute between the San Francisco 49ers and the city of Santa Clara over the management of Levi’s Stadium has finally landed in court, with the team hoping to score a favorable ruling on its contractual compliance. The 49ers’ stadium management company filed suit in Santa Clara Superior Court on Friday, asking a judge to bring resolution as the parties continue to spar over how to co-manage the stadium built in 2012 and opened in 2014. The 49ers claim the city council, which convenes as the Santa Clara Stadium Authority when discussing matters pertinent to the operation of the football stadium, is making unfounded accusations against the team and threatening to dissolve the lengthy contract that underpins the partnership between the public entity and the National Football League franchise. “The Stadium Authority has embarked on a scheme to concoct and fabricate false accusations of breach or nonperformance by Management Company in order to create a pretext for terminating the Stadium Management Agreement,” the 49ers say in the six-page complaint. 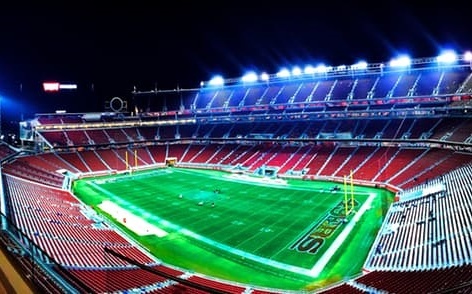 The stadium-management agreement is the rather long contract that serves as a guiding document and stipulates the division of responsibility and revenues derived from not only the eight annual NFL games held at Levi’s Stadium, but also other sporting and entertainment events such as concerts. In recent weeks, Santa Clara city officials have accused the 49ers of breaching their obligations under the contract, including using public money to reseed the stadium turf in advance of games and after concerts have been held. Santa Clara Mayor Lisa Gillmor, who is named as a defendant in the lawsuit, has led the charge against the 49ers, saying the team has been less than forthright about the use of taxpayer dollars and has purposely withheld important accounting documents from the city in violation of the deal. During the Nov. 23 Santa Clara City Council meeting, Gillmor said the team had 30 days to turn over several documents that the city and its auditing firm said were essential to ensuring the terms of the agreement were being followed. The 49ers balked at the demand, saying auditors and city officials were welcome to come and view the requested documents but they did not want to risk turning those documents into public records, viewable by anyone including potential competitors, who could use such purportedly proprietary information to gain a competitive advantage in the marketplace. Gillmor said the Santa Clara Stadium Authority has the right to view documents that will help it make decisions pertinent to maximizing the nearly $850 million investment made by the city when it took out bonds in 2011. “Looking at the agreement, there is nothing prohibiting the Stadium Authority from looking at those documents,” Gillmor said. Other members of the council appeared equally unconvinced. The same jabbing that occurred in public continued behind the scenes, according to several letters published along with the complaint Friday. “While a majority of the Stadium Authority Board may find it politically advantageous to make such claims in public, and to aggrandize itself with wholly baseless threats to terminate the Agreement, you and your staff know perfectly well this is all a charade,” wrote Hannah Gordon, general counsel for the 49ers. The 49ers also continued to insist in letters and emails throughout December that the team had made all the requested documents available to the Stadium Authority in a manner consistent with the agreement, but the city insisted they hadn’t. The team is asking the court to “declare the parties rights and obligations under the Stadium Management Agreement,” according to the complaint, which was filed by attorney Jonathan Bass of Coblentz Patch. The 49ers are not helped by the fact that its football team has failed miserably since moving into its new digs about two years ago. They raised ticket prices, parted ways with their highly successful coach Jim Harbaugh, and then fired each of his replacements in successive years. This year, the team won just two games and the only thing saving it from being the worst franchise in the NFL is the one-win Cleveland Browns. Meanwhile, the city of Santa Clara has not operated without occasional blemishes of controversy in recent weeks, as its attorney Richard Nosky tendered his resignation on Friday, the same day the 49ers filed the complaint. Jennifer Yamaguma, spokeswoman for the city of Santa Clara, declined to comment on the reasons for Nosky’s resignation when reached by email Monday. The city is also currently reviewing the 49ers’ lawsuit and declined to comment in the meantime. An email to Gordon was not returned by press time Monday.